Author contributions: Rajasekaran SA solely contributed to this paper. Curcumin, also known as diferuloylmethane, is derived from the plant Curcuma longa and is the active ingredient of the spice turmeric. The therapeutic activities of curcumin for a wide variety of diseases such as diabetes, allergies, arthritis and other chronic and inflammatory diseases have been known for a long time. More recently, curcumin’s therapeutic potential for preventing and treating various cancers is being recognized. As curcumin’s therapeutic promise is being explored more systematically in various diseases, it has become clear that, due to its increased bioavailability in the gastrointestinal tract, curcumin may be particularly suited to be developed to treat gastrointestinal diseases. This review summarizes some of the current literature of curcumin’s anti-inflammatory, anti-oxidant and anti-cancer potential in inflammatory bowel diseases, hepatic fibrosis and gastrointestinal cancers. Curcumin (Curcuma longa) is the active ingredient of the spice turmeric, used in cooking in India and other regions of Asia. It has a long history as an herbal remedy for a variety of diseases and was used in Indian and Chinese traditional medicine as early as 700 AD. Multiple therapeutic activities have been attributed to curcumin mostly because of its anti-inflammatory and anti-oxidant effects. As such, curcumin was predominantly used to treat inflammatory conditions including bronchitis, colds, parasitic worms, leprosy, arthritis and inflammations of bladder, liver, kidney and skin, and to improve symptoms such as fever and diarrhea. In addition, curcumin is thought to have beneficial effects in diseases of the neurological system including Alzheimer’s disease. Most recently, curcumin has demonstrated chemopreventive and anti-cancer effects in several human cancers[2,3]. In particular, curcumin may slow the growth of gastrointestinal cancers including esophageal, mouth, intestinal, stomach and colon, probably due to its increased bioavailability in the gastrointestinal tract. Curcumin has also been suggested as a remedy for liver and other digestive diseases such as irritable bowel syndrome, colitis, Crohn’s disease and bacterial and parasitic diseases. This review seeks to summarize some of the cellular effects of curcumin and explores the possibilities of curcumin in treating gastrointestinal diseases (Figure 1). Figure 1 Molecular targets of curcumin in gastrointestinal diseases. These include AID, activation-induced cytidine deaminase; Akt; AP-1: activated protein-1; α-SMA: alpha smooth muscle actin; caspase-3; ATM/Chk1; Ca2+/calmodulin; CD11b; C/EBPalpha: CCAAT/enhancer-binding protein alpha; COX-2: cyclooxygenase-2; CTGF: connective tissue growth factor; CXCR1: chemokine receptor 1; CXCR2: chemokine receptor 2; cyclin D1; cyclin E; CYP1A1: cytochrome P-450 A1; CYP1B1: cytochrome P-450 B1; EGFR: epidermal growth factor receptor; HIF-1: hypoxia-inducible factor-1; HO-1: heme oxygenase 1; HSP70: heat shock protein 70; IGF-1R: insulin-like growth factor 1 receptor; IGFBP-5: insulin-like growth factor binding protein-5; IL-1β/8/10: interleukin-1beta/8/10; iNOS: inducible nitric oxide synthase; JNK: C-jun N-terminal kinase; MAPK/ERK: mitogen-activated protein kinase/extracellular receptor kinase; MCP-1: monocyte chemoattractant protein 1; miR-21, -22, 200: microRNA-21, -22, -200; MMP-2/9: matrix metalloproteinase-2/9; mTOR: mammalian target of rapamycin; MyD88: myeloid differentiation primary response gene (88); NF-κB: nuclear factor-kappa B; Notch-1; p38 MAPK: p38 mitogen-activated protein kinase; PAK1: p21-activated kinase 1; PGE2: prostaglandin E2; P-gp: P-glycoprotein; PPARγ: peroxisome proliferator-activated receptor gamma; procollagen type I; ROS: reactive oxygen species; RTKN: rhotekin; Sp1, -3, -4; STAT3: signal transducers and activators of transcription 3; surviving/BIRC5; TGF-β1: transforming growth factor-beta1; TIMPs: tissue inhibitors of MMPs; TLR-4: toll-like receptor-4; TRPV-1: transient potential vanilloid receptor-1; uPA: urokinase-type plasminogen activator; VCAM-1: vascular cell adhesion molecule-1; WT-1: Wilms’ tumor gene 1. Curcumin, a hydrophobic polyphenol, is the yellow pigment in the Indian spice turmeric derived from the rhizome of the herb Curcuma longa. Curcumin is also known as diferuloylmethane and chemically is a bis-α, β-unsaturated β-diketone. Differing in methoxy substitutions on the aromatic ring, turmeric contains three natural analogues, the so-called curcuminoids, with curcumin being the most abundant (77%) and the less common demethoxycurcumin (17%) and bisdemethoxycurcumin (3%). Curcumin, demethoxycurcumin and bisdemethoxycurcumin differ in their chemical structures only with regard to methoxy substitutions and, while the overall biological activities of these curcuminoids including antioxidant, anti-inflammatory, anti-microbial and anti-carcinogenic properties appear to be comparable, differences in their efficiencies have been observed. In addition, several other naturally occurring bioactive compounds have some structural similarity with curcumin such as ferulic acid, cinnamic acid, caffeic acid, capsaicin and gingerol. Like curcuminoids, these compounds possess antioxidant, anti-inflammatory and anti-tumor activity. However, whether and how the differences in these compounds can be exploited pharmacologically remains to be determined. In general, natural products are a rich source of potentially therapeutic drugs but many natural products have to be structurally modified and optimized to become useful pharmacological agents. In the case of curcumin, the poor aqueous solubility and relatively low bioavailability have been major obstacles for its clinical development as a therapeutic drug. To enhance the solubility and stability and to increase its therapeutic potential, various curcumin analogs have been synthesized. Based on the modification of the basic structure, these compounds are being broadly grouped as “curcumin derivatives” (retain the basic structural features of curcumin), “curcumin analogues” (all other compounds with some structural analogy to curcumin) and “metal complexes of curcumin.” In contrast to curcumin analogues, often not obtained from curcumin directly, curcumin derivatives are generally synthesized by derivatization starting from curcumin. Modifications include acetylation, alkylation, glycosylation and amino acetylation of the phenolic hydroxyl group; demethylation of the methoxy groups; or acetylation, alkylation and substitution of the reactive methylene group of the linker (reviewed in). Although comparison of the potency of curcumin and its derivatives among different studies is difficult due to the variety of assays and assay systems used, some general trends have emerged regarding the function of the different reactive groups. For example, the phenolic hydroxyl groups are important for curcumin's anti-oxidant activities, the C7 linker and its carbonyl functions are important for anti-inflammatory activity and the conjugated enones have been shown to act as Michael acceptors for curcumin’s anti-cancer activity (for a comprehensive review see[4,6]). While the number of curcumin derivatives and analogues is increasing, one of the better known is diphenyl difluoroketone (EF24), a fluorinated analogue that does not have a phenolic hydroxyl group and possesses only one enone. EF24 has been reported to have greater biological activity and bioavailability than curcumin without increased toxicity and it also seems to possess a distinctive mechanism of action from curcumin. While EF24 has been shown to have a more potent anti-cancer activity than curcumin, its therapeutic potential in other diseases remains to be determined. Curcumin has been ascribed a multitude of therapeutic activities and has been associated with suppression of inflammation, angiogenesis, tumorigenesis, and diabetes, and with therapeutic effects in diseases of the cardiovascular, pulmonary and neurological systems and of skin and liver. In general, most of these effects can be attributed to the antioxidant, anti-inflammatory and anti-cancer activities of curcumin. Curcumin is an effective scavenger of reactive oxygen species and reactive nitrogen species. Curcumin’s protective function against peroxidative damage of biomembranes, known to be a free-radical-mediated chain reaction, has mainly been attributed to the scavenging of the reactive free radicals involved in peroxidation. These scavenging properties of curcumin have also been considered to be responsible for its protective role against oxidative damage of DNA and proteins, believed to be associated with a variety of chronic diseases such as cancer, atherosclerosis, neurodegenerative diseases and aging. In addition to its direct antioxidant activity, curcumin may function indirectly as an antioxidant by inhibiting the activity of inflammatory enzymes or by enhancing the synthesis of glutathione. The anti-inflammatory activity of curcumin seems to be comparable to steroidal drugs and non-steroidal drugs such as indomethacin and phenylbutazone. Many studies of curcumin’s anti-inflammatory properties point to its ability to suppress prostaglandin synthesis by its effect on cyclooxygenase (COX), a key enzyme responsible for the conversion of arachidonic acid to prostaglandins. Curcumin has also been shown to suppress the production of cytokines such as interferon-γ (IFN-γ), interleukins and tumor necrosis factor (TNF); to inhibit the inducible nitric oxide synthase (iNOS); and to suppress the activation of NF-κB[9,10]. These pathways affected by curcumin not only play an important role in inflammation; they have also been associated with the development and progression of cancer. Curcumin has promising chemopreventive and therapeutic potential for various cancers including leukemia, lymphoma and cancers of the gastrointestinal tract, genitourinary system, breast, ovary, head and neck, lung and skin. Aside from avoiding well-established risk factors such as smoking or obesity, the chemopreventive effects of curcumin are one of the most promising approaches to reduce the risk of cancer. Curcumin likely exerts its inhibitory effect on cancer development by several mechanisms such as inhibition of carcinogen activation and stimulation of carcinogen detoxification, prevention of oxidative DNA damage and its capacity to reduce inflammation. In several culture and in vivo models, curcumin has been shown to modulate enzymes that are involved in the metabolic activation of carcinogens (e.g. inhibition of cytochrome P450) and the detoxification and excretion of such compounds (e.g. induction of glutathione-S-transferase). Of cancer therapeutic interest is the ability of curcumin to induce cell cycle arrest and apoptosis specifically in cancer cells and to inhibit angiogenesis and metastasis. Experimental evidence suggests that curcumin modulates major signaling pathways involved in apoptotic cell death by stimulating pro-apoptotic enzymes such as caspases or by inhibiting cell survival pathways such as Akt, NF-κB, AP-1 and JNK. In addition, curcumin exhibits anti-proliferative effects by either modulation of oncogenes and tumor suppressor genes and/or through cell cycle regulatory proteins and checkpoints, thus inducing cell cycle arrest followed by apoptosis. One of the major problems associated with cancer progression to an aggressive disease is angiogenesis, the development of new blood vessels that fuel the rapid growth of tumors. One of the prime factors regulating angiogenesis is vascular endothelial growth factor (VEGF). Curcumin has been shown not only to inhibit VEGF but also other angiogenic factors and could prove effective in preventing the progression of cancer to an aggressive disease. Metastasis is one of the main causes of cancer death with invasive tumors. Interestingly, curcumin treatment significantly inhibits matrix metalloproteinases, a family of zinc-dependent endopeptidases that degrade extracellular matrix, allowing tumors to invade. Thus curcumin inhibits a variety of critical steps in the early development of cancer as well as in the progression of cancer to an aggressive and deadly disease and has the potential to develop into a potent cancer therapeutic. Curcumin affects a multitude of molecular targets that include transcription factors, receptors, kinases, inflammatory cytokines and other enzymes (for a comprehensive review see), which may partly explain its effectiveness against a variety of diseases. However, it is imperative to distinguish between the primary molecular targets of curcumin and the events caused as downstream effects. For example, curcumin regulates expression and function of COX-2 and 5-LOX, which are important mediators of inflammation by pleiotropic mechanisms on the transcriptional and post-translational level. But, in recent years, curcumin has been found to bind physically to more than 30 proteins; of these, many are directly relevant to the biological activities of curcumin. Interactors of curcumin include albumin; ions such as Zn2+, Cu2+ and Fe2+; transcription factors; growth factor receptors; cytokines; genes involved in cell proliferation and apoptosis; and various other enzymes. One of the better characterized interactions is the binding of curcumin to tubulin, where it inhibits microtubule assembly. In HeLa and MCF-7 cells, curcumin induces tubulin aggregation and depolymerizes interphase and mitotic microtubules. One interesting feature of curcumin is its ability to cross-link proteins. For example, curcumin has been shown to cross-link the cystic fibrosis chloride channel CFTR, thereby activating the channel. Because curcumin has such a wide range of target proteins, it remains to be determined whether curcumin binds to a specific structural motif. Identification of curcumin’s binding motifs will not only be important to understand curcumin’s biological roles but also be a major step in developing more specific and effective curcumin analogs for therapy. One of the major problems of developing curcumin as a pharmacological therapeutic is its low general bioavailability. However, clinical trials suggest that biologically active levels of curcumin can be achieved in the gastrointestinal tract after oral delivery. This increased availability together with its anti-cancer activity shows promise for curcumin to be developed as a chemotherapeutic agent for gastrointestinal cancers. Although studies on curcumin in cancers of the oral cavity are very limited, curcumin has shown some promise in the prevention of oral carcinogenesis. In the 7, 12-dimethylbenz[a]anthracene (DMBA) hamster buccal pouch model of carcinogenesis, curcumin alone[18,19] or when administered together with piperine significantly reduced the formation of oral carcinoma, probably due to its anti-lipidperoxidative and antioxidant potential together with its effect on modulating carcinogen detoxification. In studies in patients with oral leukoplakia, considered a premalignant lesion, an increase in vitamin C and E suggested that curcumin could mediate anticancer activities by increasing the local and systemic anti-oxidant status, thus preventing lipid peroxidation and DNA damage. Other studies suggested that curcumin might act as an oral cavity chemopreventive agent via its ability to inhibit carcinogen activation by inducing expression of and increasing the function of cytochrome P-450 (CYP) 1A1 and/or CYP1B1. In leukoplakia cells (MSK-Leuk1s) but not in immortalized oral mucosa epithelial cells (NOM9-CT), curcumin inhibited cell growth by affecting the translation machinery and inhibiting cap-dependent translation. In oral epithelial GNM cells, curcumin reduced the expression of heat shock protein 70 (HSP70). High levels of HSP70 protein have been associated with tumor progression. Chang et al reported that in oral keratinocytes, curcumin activates p38, which, in turn, activated the C/EBPalpha (CCAAT/enhancer-binding protein alpha) transactivator to induce insulin-like growth factor binding protein-5 (IGFBP-5). IGFBP-5 upregulation is associated with the suppression of oral cancer cell tumorigenesis in xenografts. In the invasive oral squamous carcinoma cell line YD-10B, curcumin exhibited anti-motility activity which was mediated by the inhibition of MAPK/ERK and NF-κB signaling and consequently down-regulation of proteolytic enzymes such as urokinase-type plasminogen activator (uPA) and matrix metalloproteinases (MMP)-2/9. Furthermore, curcumin-abrogated smokeless tobacco induced activation of NF-κB and expression of COX-2 in oral premalignant and cancer cells in vitro. Interestingly, in three independent studies in human submandibular gland adenocarcinoma cells (HSG), curcumin induced apoptosis through generation of reactive oxygen species (ROS)[28-31], suggesting that curcumin can induce cell death in these cancer cells. Esophageal cancer consists of two types, squamous cell carcinoma and adenocarcinoma. Even with current treatment, overall survival in patients with esophageal cancer remains poor. While there is a desperate need of innovative treatment strategies for esophageal cancer, only a few studies have tested whether curcumin could be a potential candidate. In Flo-1 and OE33 adenocarcinoma cell lines, curcumin inhibited NF-κB activity and induced apoptosis. Curcumin also enhanced 5-fluorouracil (5-FU) and cisplatin (CDDP)-mediated chemosensitivity. In a different study, curcumin induced cell death in the two adenocarcinoma cell lines OE33 and OE19 as well as in two squamous cell carcinoma cell lines OE21 and KYSE450 in a dose-dependent manner, probably by inhibiting the ubiquitin-proteasome system. In the squamous cell carcinoma cell line HKESC-1, curcumin partially reversed the mitogenic effect of prostaglandin E2 (PGE2) that has been implicated in esophageal squamous cell carcinoma growth. In addition to its potential chemotherapeutic effect, curcumin might have chemopreventive effects in esophageal cancer. In studies of N-nitrosomethylbenzylamine (NMBA)-induced esophageal carcinogenesis in rats, curcumin inhibited incidence and multiplicity of preneoplastic lesions when given during the post initiation phase and the initiation phase. Helicobacter pylori (H. pylori) infection of gastric epithelial cells is one of the key mechanisms in the development of gastric cancer. One of the proposed molecular mechanisms of H. pylori-induced carcinogenesis is the anomalous expression of activation-induced cytidine deaminase (AID), a process that involves NF-κB activation by H. pylori. Interestingly, curcumin downregulated H. pylori-induced AID expression via the inhibition of the NF-κB pathway. In addition, curcumin has direct antimicrobial activity against H. pylori and eradicated H. pylori in vitro and in vivo[38,39]. Thus, curcumin could be considered as a potential chemopreventive agent against H. pylori-induced gastric carcinogenesis[37-40]. Another pathway that has been implicated in gastric tumorigenesis and chemoresistance is one involving Rho, the Rho effector rhotekin (RTKN) and NF-κB. Curcumin was able to block the RTKN-mediated anti-apoptotic effect in AGS cells, a cell line that has been previously used to show that curcumin can inhibit the growth of gastric carcinoma cells. In cultured gastric cancer cells (BGC823, SGC7901, MKN1 and MGC803), curcumin inhibited invasion and proliferation by downregulating p21-activated kinase 1 (PAK1) activity and cyclin D1 expression. Reduced cyclin D and E levels were also found in KATO-III gastric cancer cells upon induction of apoptosis by curcumin. In addition, curcumin can reverse the multidrug resistance in the resistant human gastric carcinoma SGC7901/VCR cell line, which might be associated with a decrease in P-glycoprotein (P-gp) function and expression and the promotion of caspase-3 activation, suggesting that curcumin might have chemotherapeutic effects. In addition, chemopreventive effects of curcumin have been demonstrated in N-methyl-N’-nitro-N-nitrosoguanidine (MNNG)-induced glandular stomach carcinogenesis[46-51] and in benzo[a]pyrene (BaP)-induced forestomach cancer in mice. A biological effect of curcumin in chemoprevention of cancer has also been suggested from phase I clinical trials. Of all the gastrointestinal cancers, curcumin’s anti-cancer potential has been best characterized in intestinal cancers using cultured tumor cells and in vivo animal models. While Phase I and II clinical trials of curcumin are ongoing and curcumin is well tolerated and pharmacologically active concentrations can be achieved in colorectal tissues in patients after oral administration, conclusive studies as to its anti-cancer activity in patients remain to be done[54-57]. Chemopreventive effects of curcumin have been demonstrated in transgenic mouse models and in tumor xenografts. In the 1,2-dimethylhydrazine (DMH)[58,59] and the azoxymethane (AOM)-induced[50,60-64] rat colon cancer model, curcumin reduced the number of aberrant crypt foci[59,63] or inhibited tumor development[50,58,60-63]. Treatment of HCT-116 colon tumor-bearing mice with curcumin resulted in reduced tumor growth. In some tumor models, curcumin analogs have been suggested to be more efficient than curcumin; GO-Y030 was found to be more potent than curcumin in inducing apoptosis in cultured human colorectal cancer cells and increased the lifespan in Apc(580D+) mice[66,67]. EF24 significantly suppressed the tumor growth of HCT-116 colon cancer xenografts. Curcumin may also enhance the effectiveness of current chemotherapeutics and, in combination with chemotherapy, may provide a superior strategy for treatment of gastrointestinal cancers. In APC (Min/+) mice, the combination therapy of curcumin and dasatinib was highly effective in causing regression of intestinal adenomas. The combination of curcumin with resveratrol was found to be more effective in inhibiting the growth of HCT-116 cells in vitro and in vivo in SCID xenografts when compared with resveratrol alone. In orthotopic colorectal cancer cell xenografts, curcumin sensitized colorectal cancer to the anti-tumor and anti-metastatic effects of capecitabine by suppressing NF-κB signaling. Liposomal curcumin in combination with oxaliplatin significantly inhibited the growth of LoVo and Colo205 xenografts and exhibited anti-angiogenic effects. Studies in cultured colon cancer cells found that curcumin can potentiate the pro-apoptotic effects of sulindac sulfone, 5-fluorouracil[75,76] and oxaliplatin[76,77]. 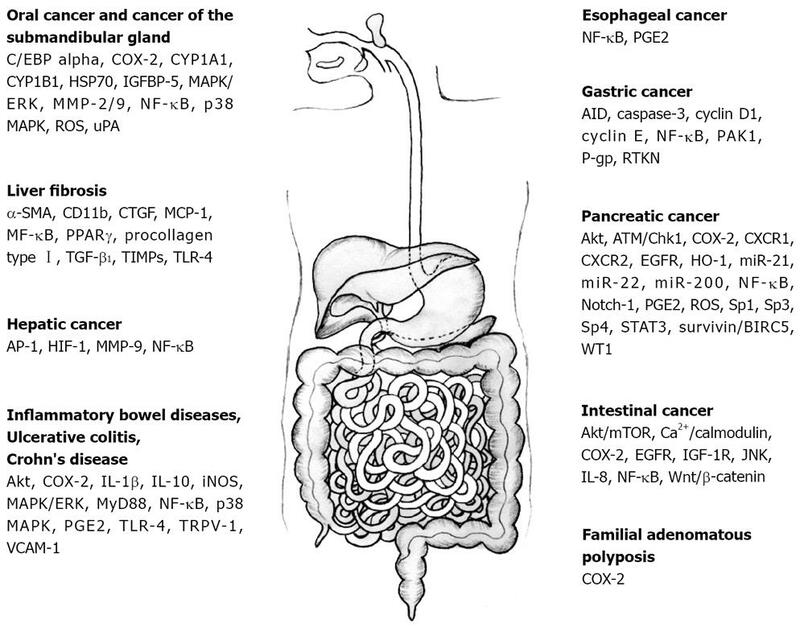 In addition to its well-characterized function in suppressing NF-κB and COX-2 signaling and other well-known mechanisms of inducing apoptosis[78-82], many more molecular targets of curcumin have been identified in colon cancer cell lines. These include inhibition of signaling pathways like EGFR[76,83-85], IGF-1R[76,85], Akt/mTOR, Wnt/β-catenin[87-89], c-jun N-terminal kinase (JNK) and Ca2+/calmodulin. In addition, curcumin may suppress the expression of factors with procarcinogenic effects such as neurotensin-induced IL-8 expression. Curcumin has also been shown to inhibit the proteasome activity and induce apoptosis in human colon cancer cells in vitro and in vivo. Radiation therapy is an integral part of the preoperative treatment of rectal cancers. Curcumin has been suggested to be a potential radiosensitizing agent with enhanced anti-angiogenic effects in colorectal cancer radiation therapy. Furthermore, curcumin blocked the transient inducible NF-κB signaling in several colon cancer cell lines that provides a prosurvival response to radiation. It also sensitized HCT-116 xenografts to gamma-radiation, suggesting that administration of curcumin could be used to reduce the side-effects usually associated with radiation therapy. One of the intriguing aspects of curcumin is its chemopreventive function in familial adenomatous polyposis (FAP), which provides an extended opportunity for intervention and cancer prevention. Indeed, combination treatment with curcumin and quercetin appeared to reduce the number and size of ileal and rectal adenomas in patients with FAP. In the Apc (Min/+) mouse model of FAP, dietary curcumin showed antioxidant effects and reduced COX-2 expression that has been associated with retardation in adenoma development[94,95]. However, while these initial studies are promising, the chemopreventive effects of curcumin in FAP require further investigation. Pancreatic cancer is often diagnosed in an advanced stage and is characterized by rapid disease progression, high invasiveness and resistance to chemotherapy. Recent research suggested that curcumin might have antitumor function in pancreatic cancer alone[96,97] or in combination with other drugs such as gemcitabine[98-102] or celecoxib. Systematic administration of a polymeric nanoparticle-encapsulated curcumin blocked tumor growth and metastasis in subcutaneous and orthotopic Pa03C xenograft models of pancreatic cancer and liposomal curcumin decreased tumor growth in cultured pancreatic cancer cells and in MiaPaCa-2 subcutaneous xenografts. Nanoparticle encapsulation of curcumin into a MePEG/poly-epsilon caprolactone (PCL) diblock copolymeric micelle enhanced the uptake and cytotoxicity in the pancreatic cancer cell lines MiaPaCa-2 and PANC-1 and polyethylene glycosylated (PEG) curcumin conjugate was more effective in inducing cell cycle arrest and apoptosis when compared with free curcumin. Phase II trials of curcumin in patients with advanced pancreatic cancer revealed that curcumin was well-tolerated and had biological activity in some patients. Many of the molecular pathways that have been implicated in the anticancer properties of curcumin in other gastrointestinal tumors have also been identified in pancreatic cancer, including inhibition of NF-κB signaling[109-111]. Inhibition of NF-κB was dependent on downregulation of the transcription factors Sp1, Sp3, and Sp4 and was accompanied by the induction of ROS[109,112]. Other targets of curcumin include Akt; COX-2; PGE2; micro RNAs miR-200, miR-21, a signature of tumor aggressiveness, and miR-22[98,112], EGFR, Notch-1, IL-8 receptors CXCR1 and CXCR2, STAT3, survivin/BIRC5, ATM/Chk1, heme oxygenase-1 (HO-1) and the transcription factor Wilms’ tumor gene 1 (WT1). STAT3 activity in pancreatic cancer cell lines was also inhibited by GO-Y030, a potent curcumin analog. Other curcumin analogs have shown higher potency than curcumin itself in pancreatic cancer. FLLL11 and FLLL12 were substantially more potent in inhibiting cell viability and inducing apoptosis than curcumin. The fluorocurcumin analog of curcumin, CDF, showed a more superior bioavailability in pancreatic tissue when compared with curcumin. Few patients with hepatocellular carcinoma are diagnosed early and treatment options are very limited. Surgery is currently the most effective treatment. However, recurrence rates are high and long-term survival is poor. Use of radiation and chemotherapy is limited and identifying novel chemopreventive and chemotherapeutic agents is imperative. Several studies have investigated the anti-carcinogenic activity of curcumin in hepatic cancer cells in vitro. In HepG2 cells, the curcumin analogue GL63 inhibited growth more effectively than curcumin; this result was associated with the activation of ER stress and apoptosis, an effect not observed with curcumin. Curcumin induced G2/M arrest and apoptosis in various hepatoma cell lines such as Huh7, Hep3B, SK-Hep-1 and QGY-7703, but in this study, HepG2 cells were reported to be curcumin-insensitive. However, several other studies reported effects of curcumin in HepG2 cells, including induction of apoptosis[125-127] through mitochondrial hyperpolarization and mitochondrial DNA damage[125,126] or through a p53-dependent pathway, and inhibition of hypoxia induced angiogenesis through down-regulation of hypoxia-inducible factor HIF-1. In Hepa1-6 cells, knockdown of the extracellular matrix metalloproteinase inducer EMMPRIN (CD147) conferred sensitivity to curcumin and curcumin blocked the transactivation of the c-met promoter by activated protein 1 (AP-1). In the highly invasive SK-Hep-1 hepatocellular carcinoma cell, curcumin had significant anti-invasion activity which was associated with inhibition of metalloproteinase MMP-9. In hepatic cancer HA22T/VGH cells, curcumin alone or in combination with cisplatin or doxorubicin exerted cell growth inhibitory and apoptotic effects, in part due to changes in NF-kB levels. Curcumin exhibited anticancer properties in several in vivo models of hepatocellular carcinoma. In mice treated with N-bis (2-hydroxypropyl) nitrosamine (DHPN), curcumin significantly inhibited liver adenoma formation and growth and in mice with diethylnitrosamine (DEN)-induced hepatocarcinogenesis, curcumin reduced tumor multiplicity and incidence. In HepG2 xenografts, tetrahydrocurcumin did not show any cytotoxic activity to HepG2 cells even at the highest doses but had anti-angiogenic effects[135-137]. In an orthotopic implantation model of hepatocellular carcinoma CBO140C12 cells curcumin suppressed intrahepatic metastasis but did not affect the growth of the implanted tumor itself. In N-nitrosodiethylamine (DENA)-initiated and phenobarbital-promoted hepatocarcinogenesis in Wistar rats, curcumin showed beneficial effects against oxidative tissue damage during chemically induced hepatocarcinogenesis[139-141], suggesting that curcumin may exhibit potential as a therapeutic in liver cancer. Liver fibrosis results from chronic damage to the liver due to excessive accumulation of extracellular matrix proteins and is considered a wound healing response to chronic liver injury. The main causes of liver fibrosis are considered to be chronic hepatitis C infection, alcohol abuse and nonalcoholic steatohepatitis. The major collagen-producing cells during chronic liver injury are hepatic stellate cells (HSCs) but the cells also include portal myofibroblasts and myofibroblasts of bone marrow origin and are activated by fibrogenic cytokines such as TGF-β1, angiotensin II and leptin. In recent years, it has been shown that advanced liver fibrosis can be reversed, thus prompting the development of antifibrotic drugs. It has been shown that curcumin can protect HSCs against activation by leptin and leptin-induced oxidative stress[142,143] by interrupting insulin signaling, by attenuation of oxidative stress[144,145], by inhibition of LDL-induced activation[146-148], by inhibiting TGF-β1 induced α-smooth muscle actin (α-SMA) expression and collagen deposition and by activation of PPARgamma (peroxisome proliferator-activated receptor gamma)[150,151]. At higher concentrations, curcumin induced apoptosis in HSCs[149,152]. Increased expression of connective tissue growth factor (CTGF) in HSCs increases ECM production and is mediated by NF-κB. In these cells, curcumin suppressed gene expression of Toll-like receptor-4, thus inhibiting NF-κB and suppressing CTGF expression. In liver fluke-infected hamsters that develop advanced periductal fibrosis, long-term treatment with curcumin reduced fibrosis via inhibition of TIMPs (tissue inhibitors of MMPs). After curcumin feeding, liver damage, cholestasis and fibrosis were reduced in Mdr2 (-/-) mice, a murine model of chronic cholangiopathy, and cholangiocyte proliferation and expression of the activation marker vascular cell adhesion molecule-1 was inhibited. In carbon tetrachloride (CCl4)-induced liver damage in Sprague-Dawley rats, curcumin inhibited CCl4-induced NF-κB expression and proinflammatory cytokines and significantly reduced hepatic collagen deposition, improved hepatic antioxidant activity[157,158] and induced apoptosis in HSCs. When liver cirrhosis was induced with thioacetamide, curcumin reduced oxidative stress, inhibited HSC activation and collagen alpha 1 expression and inhibited the development of liver cirrhosis. Mice fed with a diet deficient in methionine and choline (MCD) develop nonalcoholic steatohepatitis. In MCD mice, curcumin significantly reduced fibrosis and decreased the intrahepatic expression of monocyte chemoattractant protein1, CD11b, procollagen type I, TIMP-1 and α-SMA. These studies suggest that curcumin might be beneficial in liver fibrosis. However, conclusive clinical trials have still not been reported. Inflammatory bowel disease (IBD) refers to two chronic inflammatory diseases: ulcerative colitis, an inflammatory disease of the colon mucosa, and Crohn’s disease with inflammation that extends much deeper mainly into the ileum. IBD mostly affects young people ages 15 to 30 but it can affect younger children and older adults. Treatment for IBD consists mainly of anti-inflammatory drugs and immunosuppressive agents. Thus, curcumin with its anti-inflammatory properties is an ideal drug candidate to possibly treat IBD. In human IBD, one study has achieved encouraging results. In a randomized, multicenter, double-blind, placebo-controlled trial to assess the efficacy of curcumin as maintenance therapy in patients with quiescent ulcerative colitis, recurrence rates in curcumin-treated patients were significantly lower than in the placebo group. In a pilot study when curcumin was administered in an open-label study to five patients with ulcerative proctitis and five patients with Crohn’s disease, all patients with proctitis improved and four patients with Crohn’s disease had a lowered CDAI score. In colonic mucosal biopsies and colonic myofibroblasts isolated from children and adults with active IBD, curcumin reduced p38 MAPK activation, enhanced IL-10 and reduced IL1-beta. In recent years, the efficacy of curcumin has been investigated in several experimental models of IBD and has shown encouraging results. However, in IL-10-deficient mice, curcumin demonstrated only limited effectiveness on Th-1-mediated colitis and only moderately improved colonic morphology, suggesting that curcumin’s protective effects are IL-10-dependent. A different study suggested that curcumin had potent anti-inflammatory effects in IL-10 deficient mice only when it was emulsified in carboxymethyl cellulose, suggesting that bioavailability might be an issue. In multidrug resistance gene deficient (mdr1a-/-) mice that spontaneously develop intestinal inflammation predominantly in the colon, addition of curcumin to the diet significantly reduced the histological signs of colonic inflammation. Using mice with dinitrobenzene sulfonic acid (DNBS)-induced colitis, curcumin was shown to attenuate colonic inflammation through a mechanism that correlated with the inhibition of the activation of NF-κB and reduction in p38 MAPK activity. In the DNBS mouse model of IBD, curcumin was shown to interact with transient potential vanilloid receptor-1 (TRPV-1) in inflamed tissue to mediate a protective action. TRPV-1 has been shown to play an important role in visceral hypersensitivity. In rats with experimentally induced colitis by intra-rectal administration of trinitrobenzenesulfonic acid (TNBS), curcumin attenuated inflammation through inhibition of toll-like receptor (TLR)-4 and MyD88, a pathway that induces NF-κB leading to inflammation[170,171], and NF-κB activation in colonic mucosa was suppressed. Curcumin also inhibited p38 MAPK signaling, down-regulated COX-2 and iNOS expression, and increased PGE2 expression in TNBS rats[173,174]. However, in TNBS-induced colitis in two different strains of mice, BALB/c and SJL/J, curcumin significantly increased survival, prevented weight loss and normalized disease activity in BALB/c mice but not SJL/J mice, suggesting that the therapeutic value of curcumin may differ depending on the nature of immune dysregulation in IBD. When rats with dinitrochlorobenzene (DNCB)-induced colitis were treated with curcumin, the mice showed a dose-dependent protection against colonic myeloperoxidase (MPO), lipid peroxidation (LPO) and alkaline phosphatase (ALP) activities. At the highest dose, curcumin inhibited DNCB-induced overexpression of NF-κB and iNOS in the colon and was almost equipotent with sulfasalazine in ameliorating colonic damage. In the dextran sulfate sodium (DSS)-induced ulcerative colitis rat model, administration of curcumin ahead of the DSS challenge mitigated the injurious effects of DSS. A hydroxypropyl-beta cyclodextrin complex of curcumin as well as solid lipid microparticles of curcumin significantly attenuated the degree of colitis caused by DSS. Curcumin may not act only on colonic epithelial cells but may also modulate the immune response by inhibiting neutrophil chemotaxis and chemokines. Neutrophils are the first cells recruited at the site of inflammation and play a key role in the innate immune responses. In IBD, transepithelial neutrophil migration leads to impaired epithelial barrier function, perpetuation of inflammation and tissue destruction. In addition, curcumin may prevent endothelial activation in IBD, critical for binding and recruitment of circulating leukocytes during the inflammatory response. In primary cultures of human intestinal microvascular endothelial cells (HIMEC), curcumin inhibited Akt/MAPK/NF-κB activity and prevented nuclear translocation of the p65 NF-κB subunit following tumor necrosis factor (TNF)-α/lipopolysaccharide (LPS) treatment. Curcumin furthermore inhibited the expression of VCAM-1 (vascular cell adhesion molecule-1) in HIMEC cells, which is critical for binding and recruitment of circulating leukocytes and reduction of COX-2 and PGE2 and inhibition of MAPK signaling. Consistent with these studies in cultured cells, in TNBS-induced colitis in mice, curcumin treatment resulted in a significant reduction of neutrophil invasion and CD4 (+) T-cell infiltration. Thus, curcumin shows promise as a potential therapeutic agent for the treatment of patients with IBD. Although the pharmacological safety of curcumin promises a great potential for treatment and prevention of various diseases, the relatively low bioavailability of curcumin is a major hurdle for clinical development. Curtailing curcumin’s bioavailability primarily are its poor absorption and rapid metabolism resulting in low serum levels, limited tissue distribution and short half-life. Distribution studies for curcumin showed its preferential accumulation in the intestine, colon and liver and might be one of the major reasons why its most promising in vivo effects have been in gastrointestinal diseases when compared with other organ systems. The liver, and to a lesser extent the intestinal mucosa, were found to be the major organs responsible for metabolism of curcumin. Once absorbed, curcumin is readily conjugated to form curcumin glucuronides and curcumin sulfates or it is reduced to hexahydrocurcumin. To date, there is no clear understanding whether these curcumin metabolites are pharmacologically as active as curcumin or whether these conjugates have effects that differ from those of curcumin. Novel approaches to overcome the problem of low bioavailability of curcumin are being developed. These approaches include adjuvants that can block the metabolic pathways of curcumin and improved formulations for curcumin delivery such as liposomes, micelles, phospholipid complexes and nanoparticles. Piperine is a known inhibitor of hepatic and intestinal glucuronidation and combined administration of piperine and curcumin greatly enhances curcumin's bioavailability. Another agent showing synergistic effects with curcumin is quercetin, used in a clinical study in patients with FAP in which the number of polyps decreased. Encapsulation of curcumin in liposomes with their hydrophilic and hydrophobic properties should offer an excellent drug delivery system. Liposomal curcumin has shown anti-tumor activity in pancreatic carcinoma cells and inhibits pancreatic carcinoma growth. In vivo studies on colorectal tumor xenografts showed that liposomal curcumin enhanced the antitumor effect of oxaliplatin. While these studies showed that liposomal curcumin is bioactive, the increased bioavailability of encapsulated curcumin in vivo still needs to be conclusively demonstrated. Nanoparticle-based systems are one of the most promising delivery systems for curcumin but are still in their infancy. A recent study using a polymer-based nanoparticle of curcumin found it to have a molecular activity similar to free curcumin in pancreatic cell lines. Encapsulation of curcumin in a pluronic block copolymer demonstrated a slow and sustained release of curcumin and showed comparable anticancer activity with free curcumin. Thus, nanotechnology-based approaches to increase curcumin delivery in vivo are evolving and are very promising in overcoming the problem of bioavailability of curcumin, a drug with high potential as a therapeutic for gastrointestinal cancers and inflammatory diseases as well as liver fibrosis. Curcumin has been used for many centuries to treat various diseases. With its vast array of molecular targets it has shown great potential as a therapeutic agent for various cancer types and for inflammatory conditions. Because of its increased bioavailability in the gastrointestinal tract, gastrointestinal diseases including inflammatory bowel diseases, hepatic fibrosis and gastrointestinal cancers are one of the most investigated diseases demonstrating the therapeutic potential of curcumin. Over many millennia, natural products have often been the only means to treat diseases and injuries. With the advances in molecular biology and combinatorial chemistry during the past few decades, natural products have taken a secondary role in drug discovery. However, in the past few years, the interest in natural drugs as compounds for drug development has been renewed. As a natural product, curcumin has taken precedence over many other compounds and biomedical research on curcumin is ever-increasing. As the problems of curcumin absorption, biodistribution, metabolism and elimination are being overcome to enhance its bioavailability, diseases of the gastrointestinal tract will be at the forefront as one of the most promising targets for curcumin therapy.